Chester offers in-ground swimming pools with the sizes, shapes, and features you desire for your municipal, neighborhood, competition, university or Y swimming pool project. Installations may be in-door or out-door, and will accommodate a wide range of weather and soil conditions. 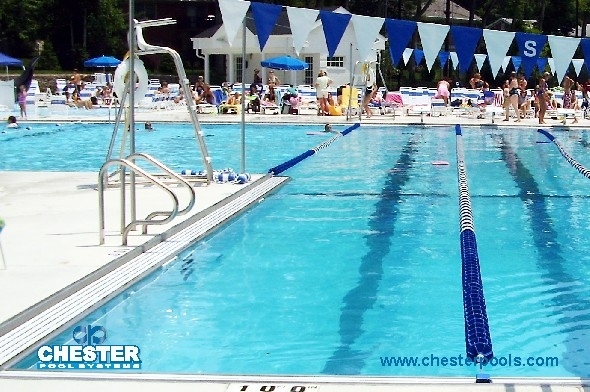 The Chester Pool System may be designed for a single aquatic activity, or a combination of aquatic needs including competition, recreation, diving, teaching, or therapy. Chester factory fabricates and pre-assembles the complete swimming pool tank with stairs, recessed steps, deck anchors, suction, and drain boxes to insure that once delivered on site, the work is completed in an efficient, high quality manner. Work that was once done only as “stick-built” construction is now being performed in a controlled factory environment. Often the pool tank can be fabricated concurrent with the site excavation and concrete work, expediting the total construction process. Factory construction eliminates the on-site weather issues that are typical with weather-dependent "stick-built" pool construction. Chester’s pool designs are optimized by the use of computer driven design and fabrication systems permitting the production of complex free-form stainless steel swimming pool shapes that previously could only have been produced by inconsistent-quality Gunite or Shotcrete construction. Chester offers two primary categories or models of in-ground swimming pools, C-20 and C-30 series pools. C-20 Series In-ground Swimming Pools typically have a total water surface area greater than 1200 sq. ft., and utilize the Chester Fast Track™ system to provide a factory built perimeter skimming overflow gutter pool tailored to the particular requirements of the facility. C-30 Series In-ground Swimming Pools have a total water surface area less than 1200 sq. ft., and utilize Chester's FastTrack™ heavy wall buttress supported construction, with individual surface skimmers located per code or with one skimmer per 500 sq. ft of area. Depending on the configuration, a Chester C-30 pool tank may be factory built, shipped to the jobsite, and set into place by crane as a single, complete unit. An unique feature of the Chester System is heavy-wall construction with perimeter footing systems that provide a complete, self-supporting structural tank that is not dependent upon backfill for wall support. For the operator, this means enhanced safety and maintenance, and the ability to completely drain the pool tank without concern for loss of integrity in the pool structure. Each Chester swimming pool is backed by years of experience in the design, fabrication, and installation of commercial in-ground pools. And since no two situations are the same, Chester's expertise can make the difference in the success of your project. Typically Chester works as either a prime contractor, or as a sub to your project's general contractor, to design, fabricate, and install the specialty scope of work normally associated with institutional aquatic facilities. Chester's total package pool systems, with prefabricated, factory tested construction, ensure low maintenance operation and long life.